Norway has never had a Timothy McVeigh or a Columbine, the kind of peacetime atrocity that makes a culture wonder what has gone wrong with its soul. Now, however, its desire to understand the motivations of Anders Behring Breivik, 33  and why the self-styled anti-Islamic militant killed 77  risks handing him the platform he obviously craves for what is expected to be a 10-week process. He is being tried for a gruesome sequence of events last July that shocked not only his country but the world: one in which he is accused of killing eight in a car bomb in the center of the Norwegian capital before driving to nearby Utoya Island and shooting 69, mostly teenage, members of the youth wing of the country's Labor Party. Breivik clearly relished his first moments on center stage  though confrontation would eventually start to erode his self-confidence. On Tuesday morning, he was given half an hour to read out a prepared statement. He took over an hour, arguing five times with the judge that the 13-page tract, which raged against multiculturalism and likened his teenage victims to Hitler Youth, was the most crucial piece of evidence the court would hear. He declared, "I am a member of the Norwegian resistance movement, and as a representative I speak on behalf of Norwegians, Scandinavians and Europeans. We demand that our ethnic rights not be taken away from us." He has admitted the killings, claiming they were necessary to prevent the Islamic colonization of Europe. But though he demanded acquittal, both defense and prosecution agree that his guilt is a formality. This case hinges instead on the gunman's mental health at the time of the attacks. 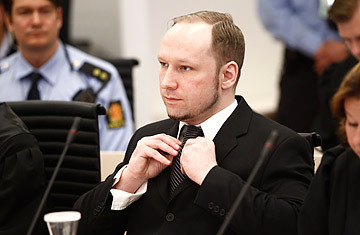 Breivik, however, wishes to be considered sane. He bragged that he had carried out "the most sophisticated and spectacular political attack in Europe since the Second World War." But he said he carried it out in self-defense like the U.S. military planners who dropped the atom bomb on Japan in 1945. "I did this out of goodness, not evil," he said. "I would do it again." The day before his hour-long, calmly delivered opening statement, Breivik had listened impassively as one of the prosecutors read out the names and grisly circumstances behind the deaths of his 77 victims, the youngest just 14. He then openly wept as the court was forced to watch a 12-minute propaganda video Breivik had made and posted on YouTube on the day of his attacks. In the grisliest part of his speech, he compared the holiday island of Utoya to a Hitler Youth indoctrination camp and told bereaved families and survivors that his victims were complicit in their deaths. "They were not innocent, nonpolitical children. These were young people who worked to actively uphold multicultural positions," he said.